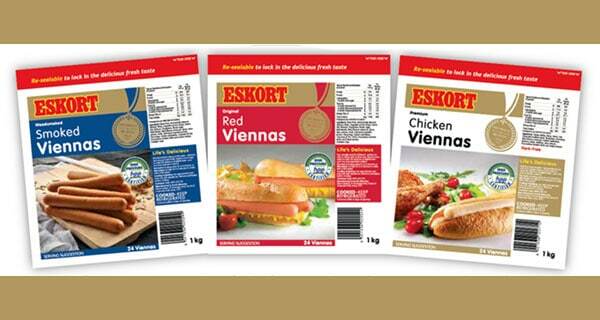 The listeriosis saga has shaken the SA food industry in many ways – and one interesting reaction that’s recently come to light is the move by Eskort to process its vienna and frankfurter sausages with High Pressure Pasteurisation (HPP). “It’s a cold water process, most commonly used to treat juices and guacamole. In Europe they call it a cold pasteurisation process – and it’s natural, or clean label. In layman’s terms, extreme pressure is exerted to destroy bacteria, and this process doubles shelf life,” says Arnold Vosloo, CEO of Eskort and head of the Category Rebuild Committee set up by the South African Meat Processors Association (SAMPA). “It’s a very expensive process so there’s a third party doing it for us at a tolling facility in Midrand. “In Europe they claim it’s 100% safe but scientists say it can never be 100% safe. What we’ve done is placed HPP stickers on the product and advertised in magazines to educate consumers about the process. By processing foods at extremely high water pressure (up to 6,000 bar / 87,000 psi – more than the deepest ocean), HPP protects consumers and companies by destroying dangerous foodborne pathogens that lead to illness, death and major recalls every year. HPP literally crushes pathogens like listeria, salmonella, E coli to death. HPP runs cold. It doesn’t alter food taste, texture or quality. Nutrients are unaffected by the pressure. HPP can extend shelf life up to several times longer than traditional preservation methods. HPP is a post-packaging solution: already-packaged products like PET bottles of juice or vacuum-packed meats are processed under evenly-distributed pressure which ensures that the packaging is never crushed/distorted. Glass packaging will not work with HPP. Treatment by HPP takes around 10 minutes.